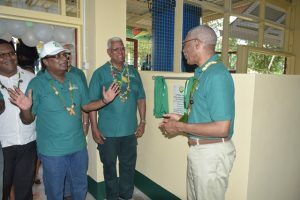 Guyana has moved one step forward to increase turmeric production, with the construction of a factory at Hosororo, North West District in Region One. He added that the fresh turmeric rhizomes, which will be processed, will be readily available for export to neighbouring districts and regions. In addition, he visualized the processed product in markets throughout other parts of the country including Georgetown. When the Depart of Public Information (DPI) spoke with residents and turmeric farmers, their greatest concern was being assured of markets. Peter Nazir, a turmeric farmer of Kamwatta, Region One, said that his concern, before expanding turmeric cultivation, was the assurance of adequate markets. Homenauth, remarked that approximately 50 acres of turmeric are under cultivation by 30 farmers. As demands increase, so will the plots, to be put under cultivation. This means that markets will be sought after for the sale of the processed turmeric. “It was mentioned, what we can earn in the region, what the farmers can earn from this venture here. This means that all the funds, all the money will remain in this region for the development of the people of this region and the region itself as a whole.” Dr. Homenauth was quoted as saying by government’s Department of Public Information.